Eurythmics' first album In The Garden was only available in the United States as an import until much later in their career. Tourists, the group that had previously brought Annie Lennox and Dave Stewart together, had stopped, and they had left the rest of those members behind. Tourists had only flirted with the Top 100 here despite their lovely moping-stalker's take on Dusty Springfield's 'I only want to be with you', which was a hit in the UK. We tend to pigeonhole Eurythmics, based on the unforgettable 'Sweet dreams (are made of this)' and 'Here comes the rain again'. But before those classics, before the new British invasion and before synth pop, Eurythmics created a striking debut on which guitar is only beginning to lose ground against the synthesizers. Unfortunately, it doesn't seem to have registered strongly on anyone's radar, on either side of the ocean. In The Garden shows the influence of post-punk's Chameleons and Magazine, and new wave's David Bowie and Blondie (whose Clem Burke played drums for In The Garden, and would later tour with Eurythmics.) There's a tension on the album between do-it-yourself ambiance and the production prowess that would become Dave Stewart's calling card. Cheap Casio-like keyboards seem to have been used intentionally for their tinny sounds. And Annie Lennox's always amazing voice ranges from dreamy to French to expressionistic. More than twenty five years later, this album resonates better than the ones that generated the hit singles we know. 'Revenge' is not to be confused with the you-done-me-wrong songs, whose ranks are deep and accomplished. We never learn any of the injustices that have brought on this subject's apparent career of getting even. One senses that this woman doesn't need much provocation to get even - any slight will do. And she's more than a little twisted in her pursuit: 'I need to play with the ones I hate / I like to see them suffer'. Exactly who is the victim here? She has very exacting standards for her revenge: 'It has to be dangerous / It has to be refined / It has to be skillful / You need to take your time'. And she boasts of her capability to follow through: 'I'm fast and I'm strong / My reflexes are good / It doesn't take long / to achieve my deserved revenge'. She cultivates her resources because, 'You never know when you might need them'. 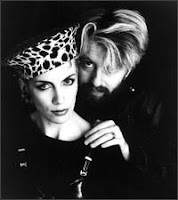 Five years later, Eurythmics titled their sixth album Revenge; it's the one that contains the hit 'Missionary man' and the European hit 'Thorn in my side'. Another of its tracks, 'A little of you', which discusses how easily and often people can wound each other, takes an interesting turn during the fade out. Unexpectedly, Annie sings 'She said "Revenge can be so sweet"' - it's a clear reference to 'Revenge' from In The Garden, and the only explicit antecedent for the new album's title. Though many of the songs on Revenge deal with strained relationships, there isn't a clear explanation for why this album would reach back to the first 'Revenge'. In some ways it's a fun inside joke, but the new context, and the wistfulness in her voice is more than a little poignant. I think of how different their lives must have been when she sang that lyric again. During the sessions for the Revenge album, Eurythmics recorded a new version of 'Revenge' called 'Revenge 2'. It doesn't seem to have been used as a b-side, but it's included in their box set. Alas, it's a horrid mess that turns its back on all of the substance of the song, and replaces it with self indulgence. Nonetheless, the great creativity and poetic imagery of the original are an emblem of Eurythmics at their best.